As surely everyone knows by now, SEO has become that little bit more difficult since Google decided to change the goalposts with the Penguin and Panda updates. Whilst keywords and meta information still have their place, content and link building are all the more important than they ever were. Guest blogging, as a form of link building, remains a vital part of SEO if it’s done properly and isn’t just rushed content, written badly in order to place a link. One of the most important aspects to guest blogging is to find quality sites in specific niche areas which want you to post, rather than article directories. Article directories tend to be of a low quality and whilst some sites which have ‘want to write for us’ splattered across the front page are genuine, plenty more are of such low quality that you would be wasting time and effort writing for them, with little in the way of return. – How predominant the call for guest posts is; if it takes over the home page then it could mean they will accept anything from anyone. – The blog is all written by different authors. These all indicate that you’re looking at an article directory, rather than a blog and won’t do your SEO efforts any good at all. Well written blogs that give the reader value is the idea, so that you and your company can create a good online footprint and become an authoritative voice. 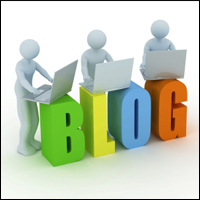 The point of guest blogging is not only to create links, but also to raise your company profile and reputation. In order to create a decent blog, it helps if you can write; if not, don’t worry, hire a professional writer to do it for you. Competition is wide and varied so in order to get noticed, it’s vital that you create useful content that gives value. When you first approach a blog to ask for a guest post spot, do your research on their site, the kind of content they generally publish and what is new and interesting that you can bring to their blog. The next step then is to approach the site owner with a decent pitch which shows you’ve (or your writer has) done your homework. It’s also a good idea to build relationships where you can by staying in contact with the blog, answering any comments and building a rapport with the owner. Remember, the nature of the internet these days is social, not just Facebook and such like, but building good, lasting, business relationships. Search for good blogs using outreach networks and going where the good bloggers live. It’s a good idea to have a good look around as, like anything, they’re not all created equally. The link above is a great post on the best blogging networks around at the moment. However, the best tool you have at your disposal is you and your ability to build relationships and cause engagement with the posts you do place. This can be the tricky part as you don’t want to damage your reputation by creating links that Google becomes suspicious of. Linking that seems to be done purely for SEO and “PageRank sculpting” will be frowned upon; Google likes to see content that is relevant, fresh and unique and ideally, chosen for great content, rather than the links it contains. As a guest blogger, it’s important to remember that the links have to be relevant to the subject matter, so if you’re writing outside of your niche, you could be playing with fire. Any links provided in the body of a guest blog need to match the site you’re writing for – additionally, they should point to quality as well, rather than flash landing pages and similar. Finally, remember that a blog is representing your company and people like for them to contain a little personal touch. Keep it friendly and ensure that it’s easy to read and suits your target audience. For ease of reading, sentences and paragraphs should be kept relatively short whilst not using over complex words. A good guide is to have paragraphs around 6 lines long, with clear white space in between each new one. The use of bold, italics and bullet points also make it much easier for the reader to scan and gives a guest post a better chance of getting shared. There’s really not that much to guest posting, but it’s important to get it right if you want to make the most of the excellent SEO benefits that it offers. Interested in contributing to the MySocialAgency blog? Get in touch today and write for us!